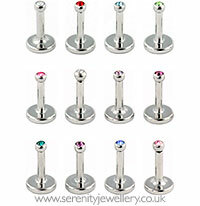 Hypoallergenic internally threaded jewelled titanium labret studs secured by 2mm screw-in balls (the balls with blue zircon crystals are 2.5mm). The flat back makes these studs particularly comfortable to sleep in. Very small and fiddly to put in as others have stated, but I find normal ball bearings difficult to deal with, so this isn't really much different. Just takes some patience but the earring stays in fine and looks cute. It's small and discreet like I wanted, so very happy. These are teeeeeeeeeeny tiny, but I like that look because I wanted something to leave in my ears all the time. Just a little bit of sparkle but I don't look like I just went shopping at Claire's. This was my first pair of internally-threaded studs, and they definitely felt like they did less damage to my ears than external threading have in the past. However, the ends are also kind of blunt so it can be a little difficult to find the hole. Also, it is a science of its own to screw the tops on these (hence the 4-stars). I considered opting for tweezers or my tiny needle nose at some point, but managed to pull it off. 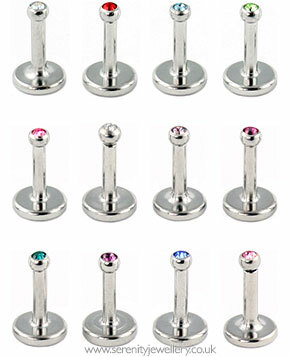 I would recommend these for earrings you want to keep in for a while. I used them in my second holes, which I rarely switch up. You'll drive yourself nuts if you try to put these on every day. 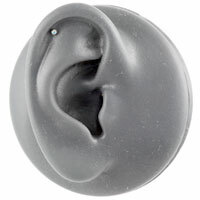 Also, others have said the gem top can slide back into the hole in your ear. This happens to me now and then, doesn't really bother me much. I just pop them forward again. Discret and small they have their charm, though they are so small that to fit can be tricky and disappointedly even closed they can still fall off the earhole. Personally I would not buy those one again. It is very small and thus very difficult to put in, but once it is in place it is perfect. 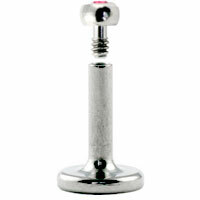 I wear one in my tragus and I do not feel it at all and I can use earphones without any problems. Not too keen on these earrings; they are VERY small and terribly fiddly, the gem is no wider than the post and can actually work their way through the ear. The internally threaded labret was difficult to post through the ear, I think the slight point on the externally threaded labrets give a bit more direction (if that makes sense?). I gave 3 stars, because Serenity are a pleasure to deal with. Very neat and subtle. I really like this labret as it is hardly felt in my tragus. The only reason not to give 5 stars is the difficulty in putting it in.